You can arrange the order of the modules on your Dashboard to suit your tastes. 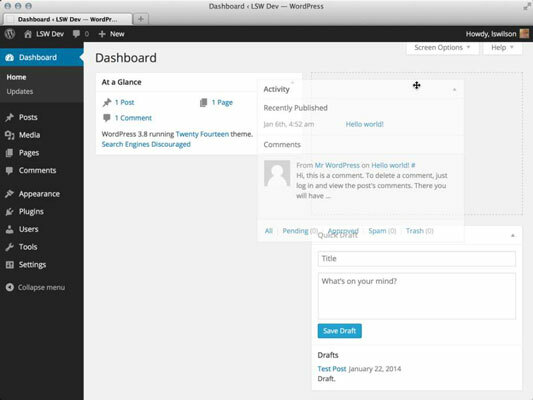 WordPress places a great deal of emphasis on user experience, and a big part of that effort results in your ability to create a Dashboard that you find most useful. Happily, changing the modules that are displayed, and the order in which they’re displayed, is easy. Hover your mouse pointer over the title bar of the Activity module. When hovering over the box title, your mouse cursor changes to the Move cursor (a cross with arrows on a PC or the hand cursor on a Mac). Click and hold your mouse button and drag the Activity module to the right side of the screen. As you drag the box, a light-gray box with a dotted border appears on the right side of your screen. That gray box is a guide that shows you where you should drop the module. Release the mouse button when you have the Activity module in place. The Activity module is now positioned on the right side of your Dashboard page, at the top. The other modules on the left shift up to fill the space left by the Activity module, and the modules on the right side shift down to make room for the Activity module. (Optional) Click once on the title bar of the Activity module. The module collapses. Click the title bar again, and the module expands. You can keep that module opened or closed based on your own preference. Repeat these steps with each module you see on the Dashboard by dragging and dropping them so that they appear in the order you prefer. 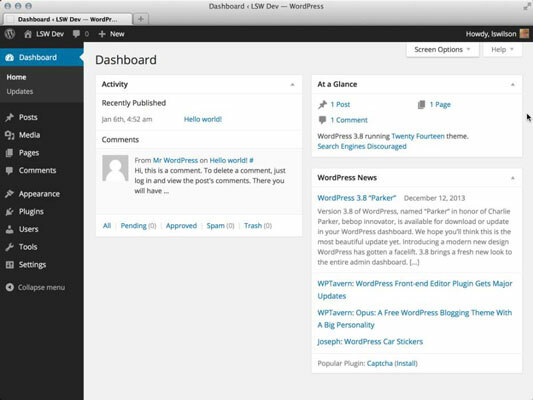 When you navigate away from the Dashboard, WordPress remembers the changes you’ve made. When you return, you still see your customized Dashboard and you don’t need to redo these changes. Click the Screen Options button at the top of the Dashboard. The Screen Options menu opens, displaying the title of each module with check boxes to the left of each title. Deselect the module you want to hide on your Dashboard. The check mark is removed from the box, and the module disappears from your Dashboard. If you remove a module in the Screen Options panel and later find that you want it back, you can always revisit the Screen Options panel and re-enable the module by selecting the check box next to the name of the module you want to show on your Dashboard.